It’s important for IWCO Direct to stay on top of the latest trends and innovations in direct marketing to deliver the best possible results for our clients. We need to lead the way with the latest products and services to support successful programs. That is why, we are always on the lookout for ideas and direct marketing innovations to incorporate into a live marketing test. One of the most transformative innovations in direct marketing has been the evolution of color digital presses. 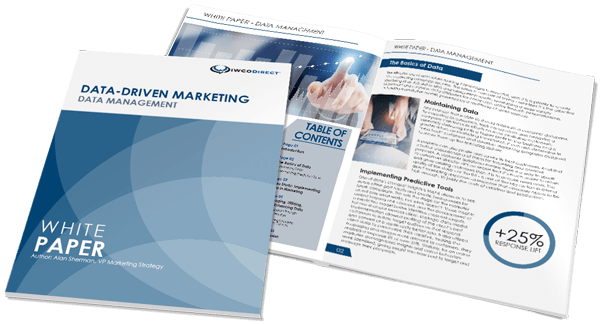 Continuous digital presses have enabled 1-to-1 direct marketing and messaging to customers on a mass scale with a solid return on marketing investment (ROMI). While that capability alone is very significant, it is more impactful when we combine it with other direct marketing innovations to create an even stronger performing mailpiece. For example, adding a matching personalized card to the personalized letter provides an even greater response and ROMI. Expansion of color digital printing capabilities, not only for personalized components, but also for all elements within a package. For continuous digital presses, it will be improved print quality and speeds along with moving to standard commodity paper stocks used in traditional lithography presses. This advancement will allow for continued downward pressure on costs while maintaining or improving print quality. There will also be a focus on adding color digital print capabilities for other components such as envelopes and cards to support the letter’s messaging. This innovation will provide an expansion in 1-to-1 marketing and messaging capabilities while improving product formats and package effectiveness. Expansion of digital finishing capabilities to support format variability and growing digital print technologies. These are closely tied because of the variable component matching and the wide range of formats that can be delivered in a single print job. This is a good example of how innovations to both finishing and variable printing are required to fully leverage the new capabilities. By adding functionality like selective cards, selective inserts, and color digital print to finishing lines, multiple package formats can be combined into a single job to maximize postage savings and minimize processing time. Expansion of digital composition tools and workflows to support the growth of the digital print and finishing technologies. As job complexity increases and time to market decreases, front-end processing becomes a critical element in supporting innovation. These advancements improve both agility and speed to market, as well as enabling more control and real-time interaction for our clients. For all of these innovation initiatives, we are performing extensive R&D testing to evaluate and support advancements that will deliver performance improvements to existing products as well as radical new solutions. The best way for our clients and prospects to collaborate with IWCO Direct on new innovations and concepts is to engage our Creative Services team. Our Engineering and R&D teams work directly with our Creative Services team to develop and evaluate new concepts on a regular basis. We have spent years gathering the talent and developing the processes to support direct marketing innovations, and we invite you to take advantage of our resources and expertise. As we look forward to what the future holds for direct marketing, we will see an acceleration in innovation as new technologies and capabilities converge. This cumulative effect will provide new opportunities to change the way consumers interact with marketing pieces. Today, our industry is focused on sending a personalized offer to each person. Tomorrow, we will be focused on providing a more tailored and interactive experience that consumers look for and even request. Manager, Product Research & Development Engineering and graduate of the University of Wisconsin – Madison. Bringing the philosophy of “anything is possible with the right planning and resources” to IWCO Direct for over a decade. A sports and outdoor enthusiast, two of his greatest passions are the Metropolis Rugby Club and hiking with his family.